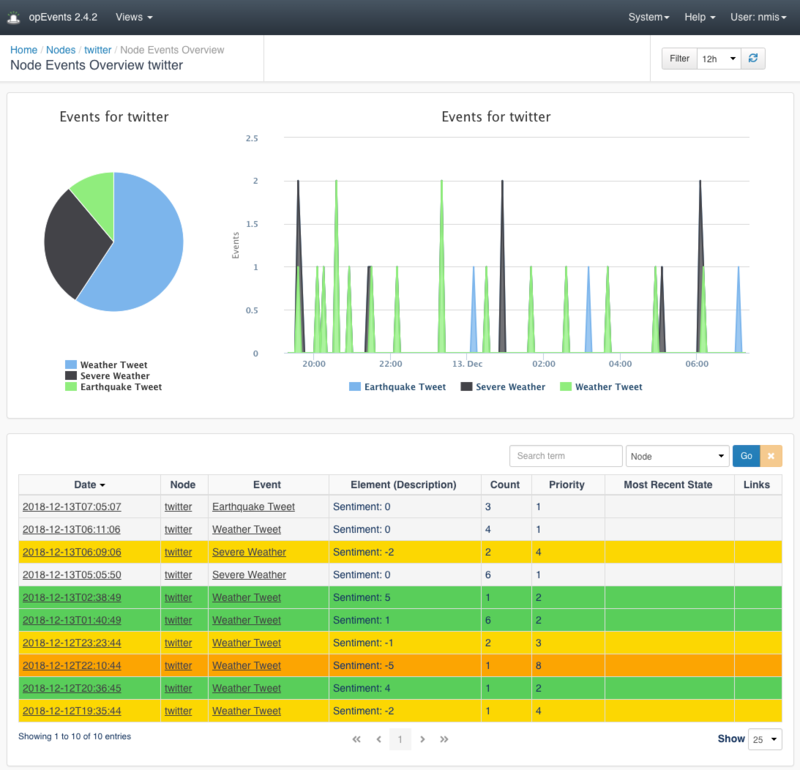 When dealing with thousands of events coming into your NOC from many locations and different customers, operators are relying on getting useful information which will help them to make sense of the events pouring through the NOC. 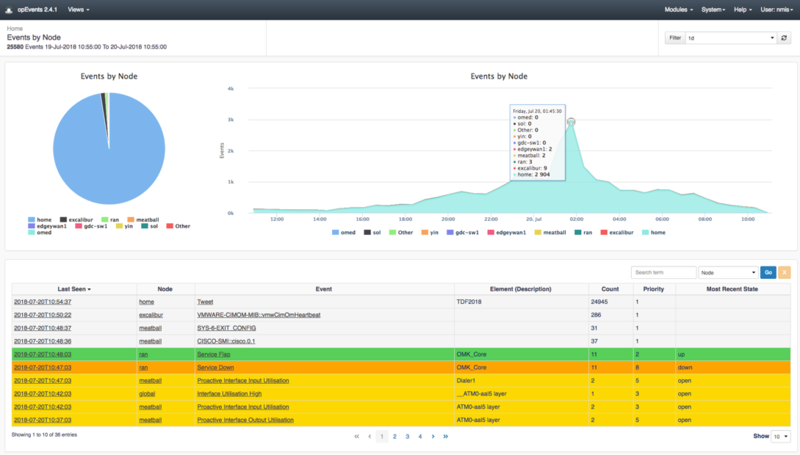 Using opEvents, it is relatively easy to bring just about any data source into your event feed so that the Operations team has improved context for what is happening and ultimately what might be the root cause of the network outage they are currently investigating. If you look into Twitter, you will find many Government and other organisations using Twitter to issue alerts and make announcements. A little bit of Googling and I found some excellent Twitter feeds for severe weather, general weather and earthquake tweets. 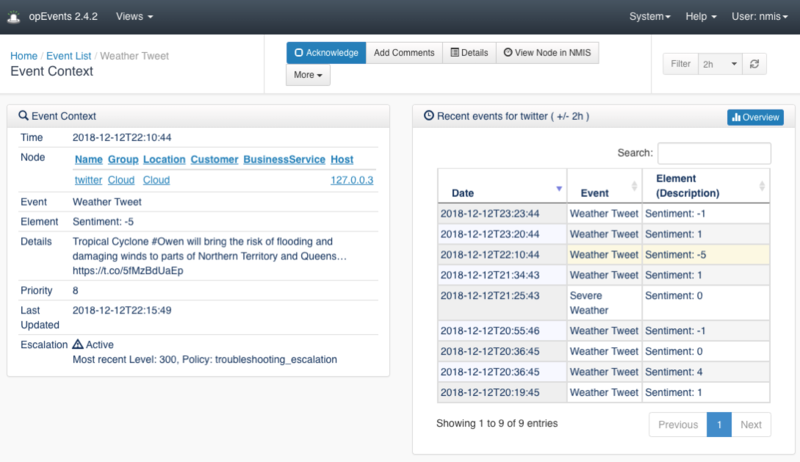 By monitoring for these in opEvents, the result is that you have tweets visualized in your overall Event Management view. There are several ways to listen to Twitter feeds. The quickest one for me was to use Node-RED, something I use for Home Automation and IoT like applications. Configuring Node-RED with the feed data above and then creating an opEvents JSON event was very straightforward. // initialise payload to be an object. Now we have a well-formed JSON document with the necessary fields, opEvents will consume that once told which directory to look into. I added the following to the opCommon.nmis in the section opevents_logs and restarted the opEvents daemon, opeventsd. The result can be seen well in opEvents when you drill into the “twitter” node (you could, of course, call this node anything you like, e.g. “weather” or “earthquake”). Clicking on one of the weather events with a high sentiment score (more on that in a second), you can see more details about this event and what impact it might have. Unfortunately we have a Tropical Cyclone in North Queensland at the moment; hopefully, no one will be injured. The sentiment score is a heuristic which calculates how positive or negative some text is, i.e., what is the sentiment of that text. The text analysis looks for keywords and computes a score, then in opEvents, we use this score to set the priority of the event so that we can better see the more critical weather events because the sentiment of those tweets will be negative. 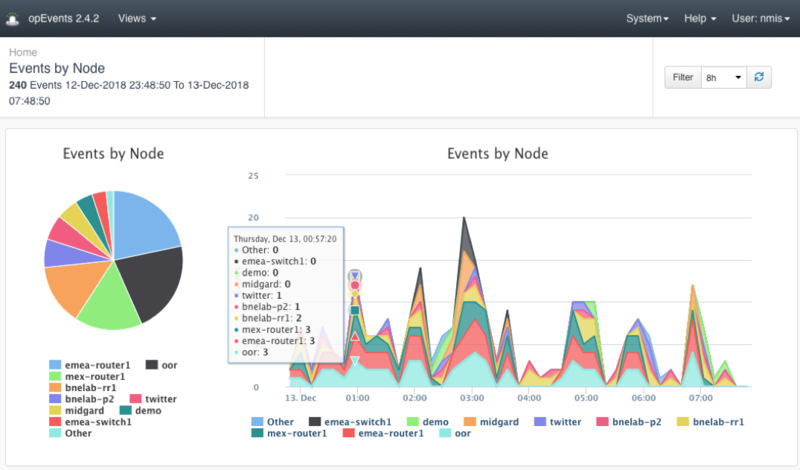 In the opEvents, EventActions.nmis I included some event policy to set the event priority based on the sentiment score which was an event property carried across from Node-RED. This carries through the rest of opEvents automagically. Because opEvents uses several techniques to make integration easy, I was able to get the tweets into the system in less than one hour (originally I was monitoring tweets about the Tour de France), then I spent a little more time looking for interesting weather tweets and refining how the events were viewed (another hour or so). If you would like an event management system which can easily integrate with any type of data from virtually any source into your workflow, then opEvents could be the right solution for you. As a bonus, you can watch the popularity of worldwide sporting events like the Tour de France.